While applying with the Internal Revenue Service for tax-exempt status in 2009, an Iowa-based anti-abortion group was asked to provide information about its members' prayer meetings, documents sent by an IRS official to the organization reveal. 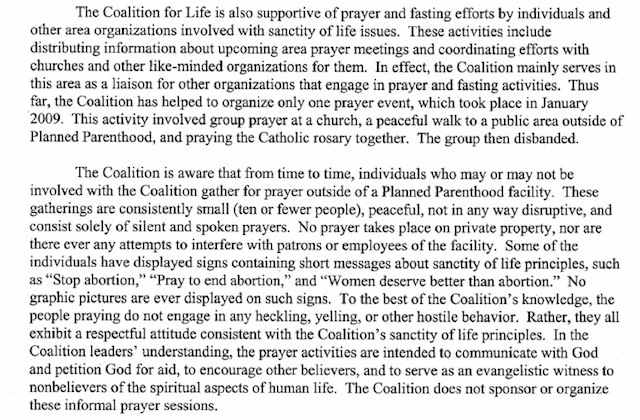 On June 22, 2009, the Coalition for Life of Iowa received a letter from the IRS office in Cincinnati, Ohio, that oversees tax exemptions requesting details about how often members pray and whether their prayers are "considered educational." "Please explain how all of your activities, including the prayer meetings held outside of Planned Parenthood, are considered educational as defined under 501(c)(3)," reads the letter, made public by the Thomas More Society, a public interest law firm that collected evidence about the IRS practices. "Organizations exempt under 501(c)(3) may present opinions with scientific or medical facts. Please explain in detail the activities at these prayer meetings. Also, please provide the percentage of time your organizations spends on prayer groups as compared with the other activities of the organization." The IRS is currently under fire for allegedly targeting conservative groups that applied for nonprofit status in recent years. In response, two IRS officials have stepped down, including Acting Commissioner Steven Miller. During a Ways and Means Committee hearing Friday on Capitol Hill, Illinois Republican Rep. Aaron Schock asked Miller specifically about the Campaign for Life of Iowa letter from 2009. “It pains me to say I can’t speak to that one either,” Miller said. He had said earlier that he would not be able to discuss individual cases during the hearing. "You don't know whether or not that would be an appropriate question to ask?" Schock replied. "Speaking outside of this case, which I don't know anything about, it would surprise me that that question was asked," Miller said.